Eucalyptus, a native species of Australia has been used by the Aboriginal people to treat sinus congestion and colds way before Europeans set foot on their land. Eucalyptus Oil is extracted via steam distillation. The active ingredient is a Cineole-based oil which is known to help relieve the symptoms of flu and colds. It also has an antibacterial effect on pathogenic bacteria in the respiratory tract. Inhaled, Eucalyptus vapours can decongest by controlling airway mucus hyper-secretions. Eucalyptus also has good anti-inflammatory and analgesic properties when used topically as a liniment. It also makes a great insect repellent and miticide. 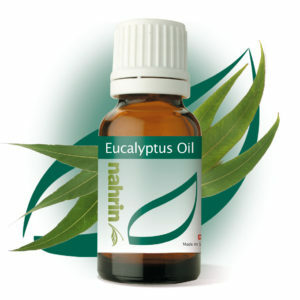 Sprains and Cramp: Mix 6 drops of Eucalyptus Oil to 10ml of Nahrin Carrier Oil and massage affected area. Chest Rub: As for sprains and cramp, mix 6 drops of Eucalyptus Oil to 10ml of Nahrin Carrier Oil and massage on chest before bed time. Aroma therapy: Add 3 drops in the water of the aroma therapy lamp. General Topical Antiseptic: Eucalyptus has a strong antiseptic properties and therefore is useful to help stop infection in healing burns, blisters, insect bites and cuts. Add 10 drops of Eucalyptus Oil to 80ml of boiled and cooled water to a spray. Make sure you shake well each time before applying to affected areas. Do not use if you have an allergy to Eucalyptus. Seek medical advice if you suffer from Diabetes. Eucalyptus can reduce blood sugar and therefore you will need to monitor blood sugar closely. All essential oils are very concentrated and therefore should not be taken internally. Seek medical advice before using any essential oils whilst pregnant. Do not use essential oil on babies under 1 year. The geranium is a native plant of Africa but since gained huge popularity in the Mediterranean as well as in many of our patio plant pots here in the UK. 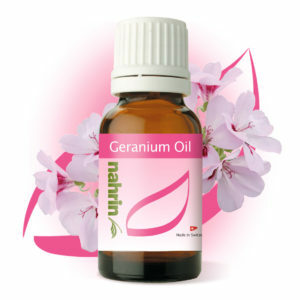 The natural geranium oil comes mainly from the leaves and is obtained through steam distillation. The oil has a sweet scent similar to rose. It can have sensitising effects in rare cases. Since it influences certain hormone secretions, it is not advisable to use when pregnant. Lavender, a native plant of the mountainous areas of the Mediterranean and Persia, where it grows in the sunny infertile soils. During July and August, when the plants are in bloom, the flower panicles are harvested, when the sun is at its highest point. This is because this is the time when the content of essential oil is at its maximum. It takes between 150-160kg of flower heads to make 1kg of essence. The oil is extracted using a steam distillation process. It is a long and expensive process which leads to some brands mixing in cheap substitutes such as lavandin to keep the price down, however this seriously affects its benefits. What’s more, we have found that the wild plants of the mountains are the most beneficial when compared to the cultivated plants grown in lower areas. Its distinctive scent is often associated with soaps and potpourris. Commonly, small sachets of dried lavender flowers have been placed in clothes draws as a deterrent to moths and placed under pillows at night to aid sleep and bring sweet dreams. Likewise you can use a few drops Nahrin Lavender Oil placed on a small cloth that can be placed in your draws or a few drops on a pillow for the same effect. Travel Sickness: Mix a few drops of Lavender Oil with a few drops of Peppermint Oil on to a handkerchief and inhale when feeling nauseous. Anti-Moth: Sprinkle 3-5 drops on a small piece of cloth and place in your draws or make a small hole in the centre of the cloth and push your coat hanger through it so that it sits at the top of the hanger. Make sure you refresh it often to maintain effectiveness. Massage: Add 3-5 drops to a massage oil. Good for sore muscles and nervous tension. Sauna: Add 3-5 drops in the sauna water. Steam bath: Add 3-5 drops to the water. Hand and foot bath: Add 2-3 drops in a recipient filled with warm or cold water. Body care: Add 1 drop into a little bit of base cream, apply on the area to be treated and have it penetrate with a light massage. Good for sore muscles and nervous tension. Air humidifier: Add 3 drops into the water of the air humidifier. Do not mix with rosemary oil. The aroma of lemons tends to conjure up the feeling of freshness and cleanliness. It is no wonder as many of our household products use this fragrance but in most cases employ a synthetically produced scent called citral. The natural lemon oil comes from the oil glands in the peel which is cold pressed and the residue is then centrifuged. At Nahrin we use about 200kg of lemons to get 1kg of essence. Lemon oil belongs to the group of essential oils which are in the ‘high oscillation’ spectrum and give an uplifting effect on your mood especially when you are feeling tired. They also stimulate the reasoning areas of the brain as opposed to the emotional areas. Lemon oil is particularly effective for sharpening concentration and strengthening memory retention, ideal to aid people who are studying for difficult exams or have a heavy load of work to get through! It is also ideal as an air bound disinfectant because of its strong germicidal properties. What’s more, you can use it to reduce itchiness and stop swelling when dabbed neat on insect bites. Add Nahrin Lemon Oil to Nahrin Carrier Oil and massage in to give a great toning effect to muscles. Lemon oil is also effective as a hair tonic. Many people use lemon oil to get strong, healthy and shinning hair. Lemon oil is also used for removing dandruff from head. Lemon oil is very light and heat sensitive so we advise keeping it in the fridge. Orange Oil, unlike many of the other Essential oils is extracted via a cold-press method from the orange peel. The scent of orange is known to have an uplifting aroma which helps alleviate anxious feelings and improve moods. Orange Oil has also become a popular ingredient in many household cleaning products because of its antiseptic properties. Adding a few drops of Orange Oil when you clean the floor can help disinfect the area. As with any essential Oil when using it on a surface, always try it out on a small area for the first time and only use a few drops. Recently, I read a research paper using Orange Essential Oil for weight loss. The research links scent and mood to weight loss. When the scent of oranges is inhaled, the brain sends a signal to our stomachs to stop sending hunger pang messages. It was found that it was particularly useful when used at the beginning of a weight loss programme. Orange Oil also makes and excellent insect repellent. Use it in an oil burner to help keep mosquitoes away when dinning outside or wipe or spray around windows and doors where pests like ants and moths get into your house. There is some evidence that Orange Oil can have phototoxic properties. That means that it can make your skin hypersensitive to the effects of the sun. We therefore recommend that you don’t apply it to your skin before subjecting it to strong sunlight. 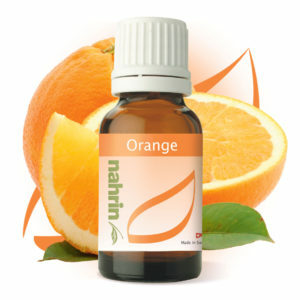 Room Freshener: Add a few drops of Nahrin Orange Oil to water and place in a spritzer bottle. Use to spray around the room for a fresh citrus aroma. Sore Throat: Mix a drop of Orange Oil to ½ cup of warm salty water and gargle. Massage: Skin treatment – good for rubbing on calluses on feet and soothing dry, irritated skin. Mix 6 drops of Orange Oil to 10ml of Nahrin Carrier Oil and massage on affected area. Aroma therapy: Add 3 drops in the water of the aroma therapy lamp. Good for relaxing and weight loss programme. Bath: Add 6 drops of Orange Oil bath to relax. Do not use if you have an allergy to citrus fruit. Do not use before going into the sun as Orange Oil can be phototoxic. Do not use if you suffer from epilepsy, liver damage or are been treated for cancer. Mentha Piperita oil is one of the most well known essences in aromatherapy. A home or travelling “pharmacy“ should not be without it. It is a very fast acting substance in acute cases and helps with dizziness, trembling and general weakness. Some drops on a handkerchief as dry inhalation has an almost immediate effect. There are several kinds of mint. The best known is the peppermint, a hybrid from water mint and green mint. Peppermint essence is extracted by steam distillation of the slightly dried leaves. For 1 kg of essence about 2000 kg of leaves are necessary. Nowadays the best quality of mint is cultivated in England and Italy. Mint oil is ideally suitable to treat headache and neck tensions. Massage one to two drops of pure essence on sore muscles and also apply on the forehead (make sure that the oil does not get into your eyes). Mint oil has a warming effect; it relieves cramps and has a stimulating effect on digestion. It helps with flatulence, nausea and vomiting, with travel sickness and seasickness and it is also a harmless remedy against morning nausea during pregnancy. Peppermint oil, diluted in water, alcohol, vinegar or fatty oil is a very good product to be used for massages to relieve sore muscles, lumbago, bruises, contusions, pains of the joints and insect bites. Great for sport massages using a concentration not stronger than 1%. 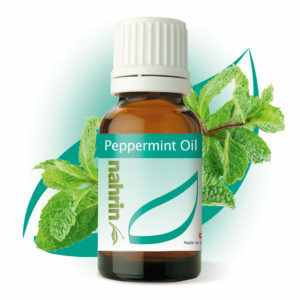 The quality of the peppermint oil is very important and should not be underestimated. For Fresh Breath: add 2 drops of peppermint oil to a glass of water used as mouth wash.
Cleansing lotion: Apply in diluted form, 2 drops on a glass of water. For best effect combine it with thyme oil. Colds and flu: Used to inhale. It can be used internally (if used internally dilute only 1-2 drops in a tea). For colds and flu combining with eucalyptus and/or Tea Tree oil has proven to be beneficial. Not suitable for people suffering from hay fever as it could unnecessarily irritate the mucous membranes. Do not use on children under the age of 7 (aroma lamp can be used). The fragrance directly from the bottle is for some oils too strong and does not represent the real fragrance once dissolved. This is particularly valid for pure oils. All essential oils are very concentrated and therefore never take neat and dilute greatly as instructed. Tea Tree Oil sometimes known as Melaleuca Oil has a fresh camphoraceous smell. It is made from the leaves of the Melaleuca Alternifolia tree through steam distillation. The shrub is indigenous to New South Wales, Australia. Research by an Australian chemist called Arthur de Ramon Penfold in the 1920s and 1930s into the effective antimicrobial properties, gave birth to the Tea Tree cultivation industry. Interest in Tea Tree Oil and popularity has grown due to its natural effectiveness against dandruff, head lice mites, fungal infections and acne. It is also a good natural treatment for ringworm and athlete’s foot. Nail Fungal Treatment: Add ½ cup of warm cider vinegar, 6 drops of Tea Tree Oil and 2 drops of either Thyme Oil or Peppermint Oil to a basin filled with warm water, ankle or wrist deep. Soak for 15 minutes. Repeat 3 times a day. Nail fungal infections are notoriously slow to go and can take up to a year even with strong prescription remedies so be patient! Vaginal Itch Discomfort: Add 4-6 drops of Tea Tree Oil to your bath water. Sit and relax in the bath for 5-10 minutes, twice a day. Head Lice: Add 2 tablespoons of Tea Tree Oil to ½ Olive Oil and massage liberally into hair. Leave for 1 hour and then comb through with a nit comb. Repeat daily until there is no evidence of lice. Acne: Wash affected area well with a gentle soap and pat dry. Add a few drops of Tea Tree Oil to a Q-tip and apply directly to the blemish and red spots. Repeat twice a day. Cold Sore/Herpes: Dab the affected area with Tea Tree Oil using a clean Q-tip. Repeat 2-3 times a day until itching stops. Insect Bites: Dab bite with Tea Tree Oil to stop itchiness. For topical use only – not to be swallowed. A small percentage of people may develop an allergic reaction. If this happens, stop the application and if discomfort persists, consult your doctor. Seek medical advice before using any essential oils whilst pregnant or breast feeding. Not recommended for people undergoing hormone-sensitive cancer treatment. Thyme Oil has been used since the Egyptian times as a body balm and fragrance. The Romans would take Thyme baths to regain strength and it is they who propagated the plant throughout Europe. In the middle ages knights would be given a sprig to give them courage. This all may sound mythical but there are good reasons for it. Thyme, amongst its many properties, stimulates circulation and therefore can help concentration and focus and revitalises tired muscles. Its warming effect can help with the symptoms of rheumatism, sciatica and gout. Another important benefit is its good antiseptic properties because of its high concentration of Thymol. It has a stronger disinfecting effect than many chemical disinfectants and what’s more has an antiviral effect. Thyme oil is produced by means of steam distillation from the flowering branches. 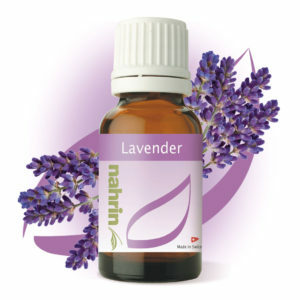 Massage: Add 3-5 drops of Nahrin Thyme Oil to 10ml of Nahrin Carrier Oil. Massage into affected area, on chest at night to relieve congestion, on sore muscles, aches and pains. Massage on cellulite can help reduce the effect. 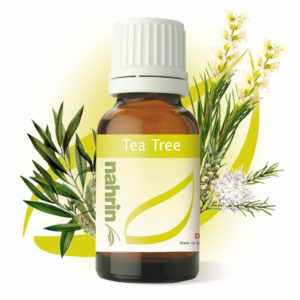 Steam Bath: Add 3-5 drops of Nahrin Thyme Oil to hot water and inhale vapours. Aroma Therapy and Air Humidifier: Add 3 drops in the water of the aromatherapy lamp as a decongestant and to disinfect. 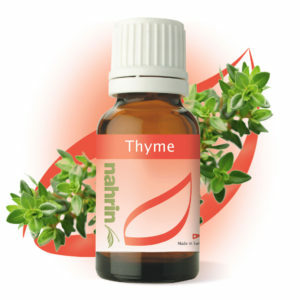 Greasy Skin and Acne: Add 2 drops of Nahrin Thyme Oil to a cup of warm water. Use cotton pads to wipe affected area. Bath: Add 10 drops to bath water. Use in conjunction with Nahrin Harmony Bubble Bath or Nahrin Seaweed Bath. Insect Bites and boils: Dab with Q-tip dipped in Thyme Oil to stop itchiness. Can irritate mucus membranes and cause skin irritation. Always patch test before using on lager surfaces. Do not use neat except for when suggested. Advice should be taken before using essential oils if you are being treated for cancer.